Boys State Pole Vault Championship, vaulting 14 feet 6 in. Special Guest Appearances by Coach Chad Miyamoto? Coach Shane Akamine? Donaldo Hopper? 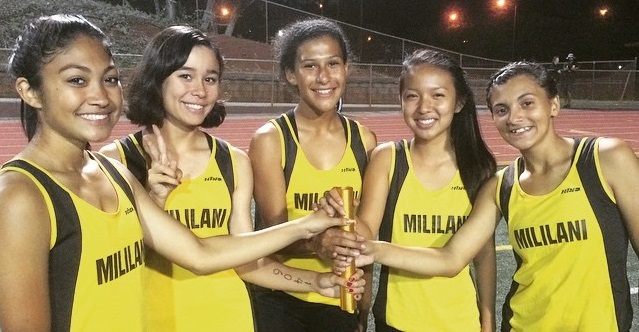 MVPs for Track and Cross Country will be announced and Mililani HS Letters will be awarded to this season's team members. Please return any uniforms you still have and settle any outstanding team obligations. the OIA Track Finals on Saturday May 2nd, Good Luck! and to those going to the Prom, have fun & stay safe. a record which stood for 34 years, since in 1981. Brown & Gold Meet Boys 800m Run - 2:06.1 sec. Trojan Pentathlon Girls 400m Dash - 61.5 sec. meet at the Track 4:00pm. practice till 5:30pm so "look at the time"
Practices will be held on Mondays and Thursdays. Khalil Stevens - 1st, Boys High Jump - 6ft. 6in. 6th, Boys Long Jump - 20ft. 9 1/2in. Kahi Nolan - 6th, Boys Pole Vault - 13ft. 6in. Gabrielle Fukumoto - 4th, Girls High Jump - 5ft. 2in. $329 includes all food, lodging, activities, seminars, goodie bag, etc. 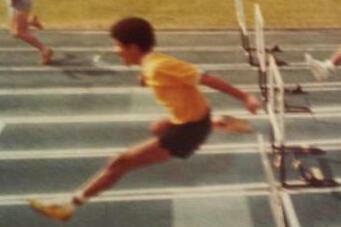 It is my sad and solemn duty to report the passing of one of the legends in the history of Mililani HS Track & Field, Gordian Boteilho-Torres, Class of 1983. Gordian was a member of the 1981 JV Championship Boys Team and held records in the 300m hurdles, 4x100m Relay and was a member of the school record setting 4x400m Relay team, a record which still stands today. Gordian had an easy-going personality, was a well-liked teammate, worked hard in practice and would always be encouraging and cheering on his teammates at the meets. It was an honor to have run with you my brother in track, and I hope that you have found peace. Aloha Gordian. It saddens me to report the passing of another Mililani Track alumnus before his time, Eric Roth, Mililani HS Class of 2010. 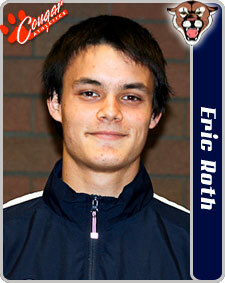 He most recently was a member of the 2011 Clackamas College Track Team in Oregon where he competed in the Pole Vault. Although he may not have accomplished all he intended in his short life, he is remembered fondly by his teammates, coaches, friends and family. Student-athletes who were fortunate enough to have participated in sports at Mililani High School during John Kauinana's tenure as Athletic Director and coach from 1973 - 2001 know firsthand the leadership, quality and heart he put into the Athletic Program, and even the athletes today still benefit from many of his accomplishments that have contributed to the Athletic Department and Mililani High School. John Kauinana passed away on June 5, 2011. 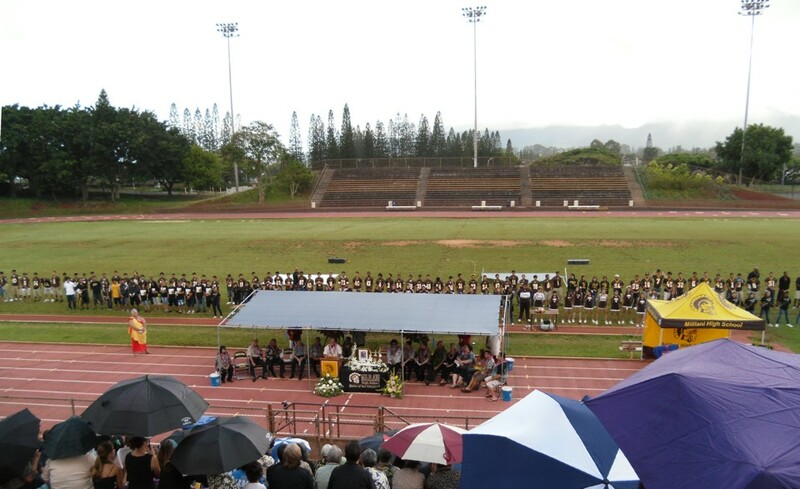 A memorial in celebration of his life, was held at the Mililani John Kauinana Stadium, on June 26th where many of his friends, family and others who have been touched by his life, reminisced about the good times they experienced while he was around. Those of you who could not attend the memorial, please take some time to remember Big John and all he has done for Mililani HS and keep his spirit alive. 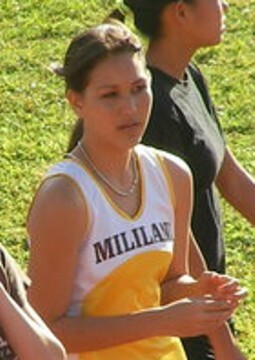 Farewell to Sheryl Wolfe, former Mililani Track and Field Sprinter, High Jumper and Miss Teen Hawaii, who passed away on Tuesday April 20. She will be missed by all who were lucky to have known her. May she rest in peace.